I don’t mention it enough these days but I am a huge fan of the classic American musical films. I remember watching all those wonderful Gene Kelly movies and admiring his dancing when I was younger (this makes me sound a lot older than I am). So to say I was looking forward to seeing Singing in the rain on stage is probably the understatement of the century. At the same time I was filled with a slight fear that this stage production wouldn’t do my memories of the movie justice. I had chosen my seat carefully after reading reports about a drenched audience in the front rows. Row H in the stalls turned out to be perfect – close enough to appreciate every detail of the show and far enough to leave the theatre with dry clothes. Did I have a good time? YES! From the first note right until the last drop of water had been splashed from the stage into the audience this production is a complete and utter delight. It may sound a bit exaggerated but Singing in a rain has somehow restored my faith in musicals. Shows like this are the reason why I adore musical theatre. 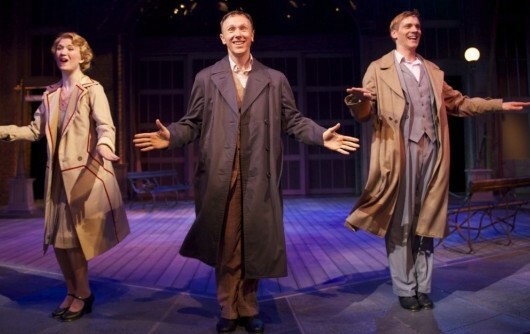 With a great score, big dance numbers and a story that is full of romance and comedy and just warms your heart this show is heaven for musical theatre fans. Adam Cooper leads the cast as Don Lockwood and he certainly does Gene Kelly justice. I have seen Adam in both Guys and Dolls and Shall we dance a few years ago and I have always adored his dancing skills. In this show he simply exceeds himself. His dancing is mesmerising. And while he may not be the greatest singer on the planet he does just fine in this role. Adam’s Don Lockwood oozes charm and his interaction with the rest of the cast is flawless. 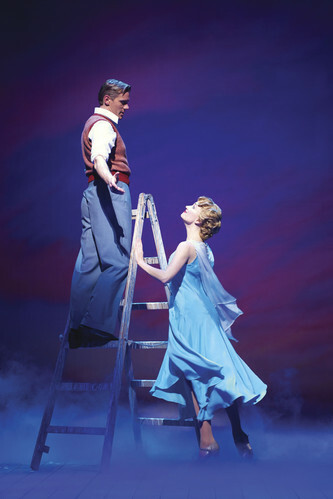 Scarlett Strallen plays Kathy Seldon with such intensity and passion it’s hard to take your eyes off her. After thinking Don had betrayed her Scarlett’s Kathy appears so vulnerable it hurts to see her stand there with slumped shoulders, tears in her eyes. Her singing is nothing but wonderful and her and Adam are the perfect on stage match. Daniel Crossley’s Cosmo Brown is witty, funny and all around likeable. His “Make ’em laugh” is one of the highlights in the show and had me laughing with both amazement and joy. For me Daniel is the secret star of the show and in combination with Adam and Scarlett this is a true triple treat. The supporting cast does a brilliant job. I’d like to give a special mention to Katherine Kingsley as Lina Lamont who is hilariously funny without turning her character into a complete joke. The whole ensemble fits together perfectly and delivers the big dance numbers with impressive energy. “And what about the rain?” you may ask. It’s spectacular, simple as that. I’m not going to completely spoil the show for those who haven’t seen it by going into too much detail but let’s just say you will get soaked more than once if you’re sitting in the first 5-6 rows. On the night I attended the show the audience seemed to love being that close to the “action” so to speak. I was left wondering what happens on a matinee day though – surely the seats in the front must be rather wet at the end of the show so how do they dry them ready for the next performance just two hours later? Answers on a postcard please (or in a comment). 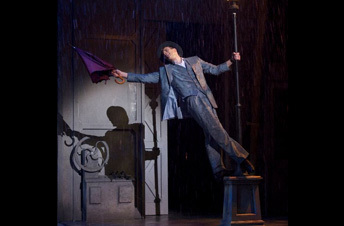 Singing in the rain is exactly what musical theatre should be like. 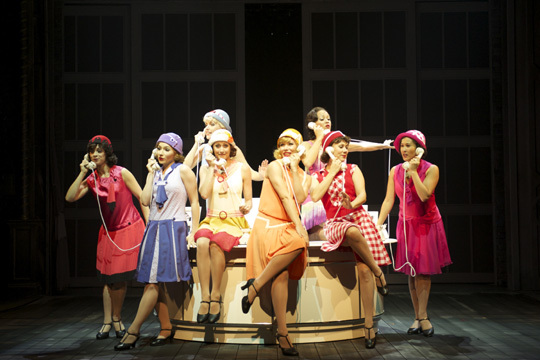 It’s funny and romantic, it has the drama and the tears and it draws the audience into a world of song and dance. I left on a complete high, humming the songs along the way. To sum it up: This show is a hit! Go see! For more info and to book tickets visit http://www.singinintherain.co.uk.